I’m a Word girl. I can’t deal with Scrivener. I have the program and for whatever reason, my brain looks at it, and threatens to explode. Since my goal is to write novels and not have my brain explode, I willing return to Microsoft Word. I’ve picked up a few tips and trips to help me maintain organization as I slice open a vein and pour out my soul. I’ve been a Microsoft user since the days of Clippy. Until Microsoft decided enough was enough. 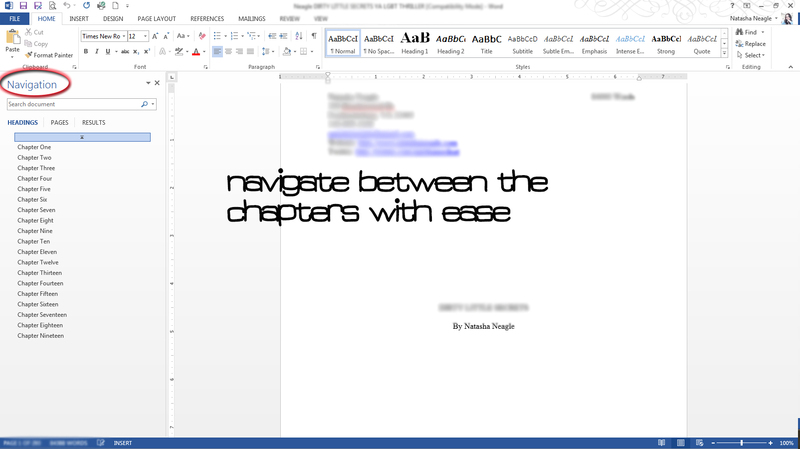 Anyway, Microsoft has come up with some pretty cool things to allow you to navigate your manuscript. I’m only going to talk about one of them: HEADERS. Before, I had to CTRL+F to find anything within my manuscript. When you’re pushing 90K, searching for that spot you were editing in Chapter Eight can take you eleventy seven minutes to find. I don’t know about you, but I have better things to do with my time. Like actually write more novels. 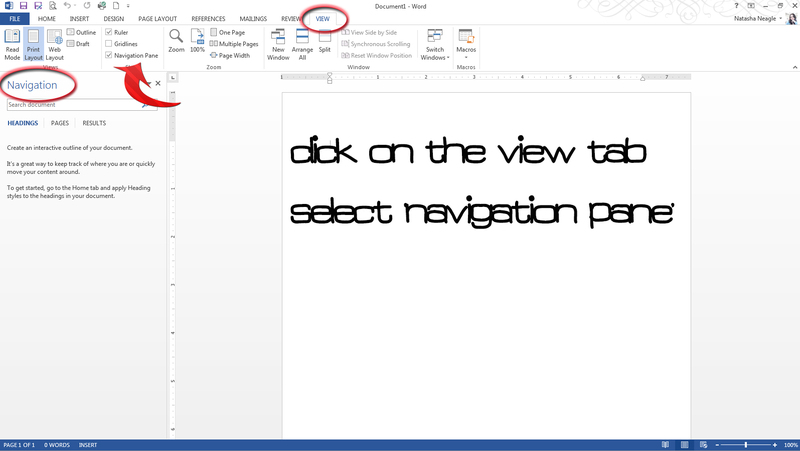 Starting with a blank word document, find the view tab. Select “NAVIGATION PANE” to pull up the side bar. 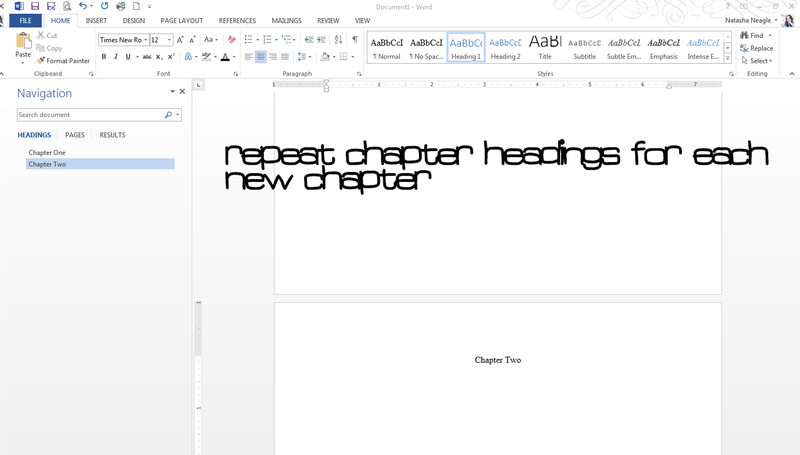 Type the Chapter One to start your manuscript as you normally type. The default setting for word is to fall under the normal paragraph style. Highlight the text you want to make into your heading, Chapter One in this example. Click the Heading 1 style. The text changes and moves the new heading to be left justified. The heading now appears in the side navigation bar. Return the font to your originally preferred font, color, etc. Repeat for each chapter. You can do this as you write or if you have an idea of how many chapters you are going to have, you can set up your manuscript before you write. A completed, organized manuscript looks like this. I hope this helps those of you that use Microsoft Word, but have a hard time remaining organized. Since I figured out how to do this, I’ve had no problems keeping my manuscript organized.